HAMMOND, IN, August 18, 2012 — Hitz Boxing presented another Fight Night at the Horseshoe this evening at The Venue in Hammond. The evening’s bouts showcased the young and old(er) of Chicago’s boxing community, including a fight for the “over 40″ World Senior Boxing Council Championship between Middleweights Mike Kurzeja and Gerald Taylor. Headlining was Fres Oquendo, keeping busy in a bout Philadelphia’s Robert Hawkins. Undefeated Ghanaian Welterweight Abdullai Amidu (19-0) was unfortunately unable to make his Horseshoe Casino debut after his opponent withdrew too late to find a substitute. Local up-and-coming boxers Paul Littleton and Dimar Ortuz successfully stepped up against quality competition in crowd-pleasing wars, while more seasoned fighters David Martin III and Johnny Lewus found themselves in deeper waters than anticipated against opponents whose records belied their skills. Simon Buettner and Frank Scalise made short work of their hapless opponents. It was an evening of entertaining and occasionally explosive scraps. Hitz Boxing’s popular “Fight Night at the Horseshoe” series will return on Saturday, August 18, 2012, at the Horseshoe Casino in Hammond, Indiana, featuring Chicago’s WBA Fedelatin Heavyweight Champion and WBA #14 rated “Fast” Fres Oquendo (34-7, 22 KOs) in the 10-round main event. HAMMOND, IN, August 21, 2011 — On the non-televised undercard of the Hitz Boxing in Association with Banner Promotions’ Fight Night at the Horseshoe ESPN Friday Night Fights event on Friday, August 19 at Horseshoe Casino in Hammond, Indiana, former world champion Montell “Ice” Griffin (50-8-1, 30 KOs) of Chicago notched his landmark 50th professional victory with a hard-fought unanimous decision over former world title challenger Deandrey Abron (15-10, 10 KOs) of Youngstown, Ohio. The two light heavyweights traded bombs throughout, but Griffin had the faster, more accurate hands. The scores were 80-72 x 3. HAMMOND, IN, August 19, 2011 — Hitz Boxing and Banner Promotions teamed up with ESPN’s Friday Night Fights to showcase three bouts between older, more experienced boxers looking to stay in the elite, and younger, stronger rivals hoping to use them as stepping stones to their own future careers. On the card were three Olympians, Chicago’s Montell Griffin and David Diaz and Demetrius Andrade. 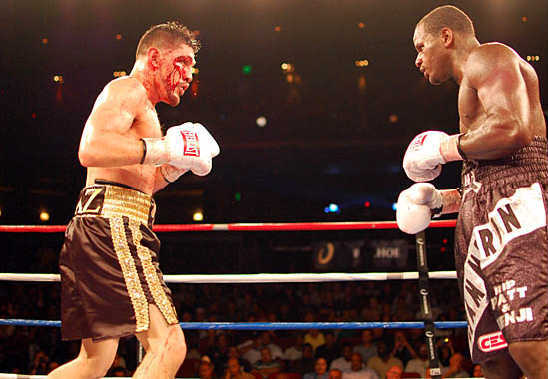 Diaz, 35, faced 28-year-old Philadelphia, Pennsylvania native “Hammerin’” Hank Lundy, a decorated amateur in his own right before embarking on his pro career, amassing a professional record of 20-1-1 (his only loss coming to John Molina), with 10 KO’s before proving his mettle by putting his NABF Lightweight title on the line against the far more experienced challenger Diaz. Demetrius Andrade had been considered one of the best prospects for a professional career of the 2008 Olympians, but has encountered some criticism for the level of competition he has encountered in his first 13 bouts, all of which he won. His decisive win against the 40-year-old but still dangerous Contender Season 2 winner Grady “Bad Boy” Brewer might allay some criticism, but Andrade’s defensive style, while effective, is proving a hard sell for casual boxing fans who prefer a less studious approach to earning a victory. The undercard featured some entertaining scraps as well, including Montell Griffin’s bout against former contender Deandrey Abron, who had no answer for Griffin’s ring experience and I.Q. Griffin perhaps had the most successful evening of the Olympic trio, notching his 50th win by schooling his younger opponent in the old-school tricks of the trade that made him a champion. COME TO THE HORSESHOE CASINO (BALLROOM C ON THE 3RD FLOOR) ON THURSDAY, AUGUST 18 AT 5 PM FOR THE OFFICIAL WEIGH-IN AND MEET ALL FIGHTERS AND ORGANIZERS FOR THE SEASON FINALE OF FRIDAY NIGHT FIGHTS BEING HELD THE FOLLOWING NIGHT! ALL ARE WELCOME! HAMMOND, IN, August 16, 2011 — The media and general public are invited to the official weigh-in for Hitz Boxing’s “Fight Night at the Horseshoe” event at the Horseshoe Casino (777 Casino Center Dr., Hammond, Indiana, in Ballroom C on the third floor) on Thursday, August 18 AT 5 PM.